ArcGIS software-based maps provide a detailed perspective of where remediation efforts are needed. Remote sensing and GIS are used to analyze global crop production capacity. 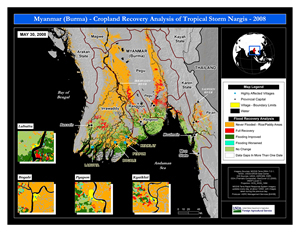 Post-Cyclone Nargis GIS maps of Myanmar monitor the ongoing flood recovery. 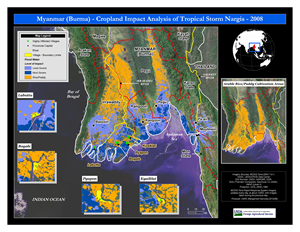 With winds of 132 miles per hour, Cyclone Nargis, a category 3 tropical storm, struck the low-lying and heavily populated Myanmar coastline on May 2, 2008. The intense storm produced a 12-foot sea wave that flooded an approximate 2,000-square-mile area with a population of 24 million. Nargis left behind 90,000 fatalities and 56,000 missing persons in Myanmar, the country once known as Burma. Data from the MODIS and Landsat satellites allow the FAS to produce a map of the cyclone-damaged rice production regions of Myanmar. Adding to the tragedy of the human lives lost, the cyclone destroyed much of Myanmar's agricultural economy. The provinces of Ayeyardwady, Yangon, Bago, and Mon, which produce 58 percent of the country's rice crop—or roughly 6.2 million tons on a milled basis—were inundated with saltwater from the flood. In addition to the cropland damage, many villages were destroyed, along with much of their food stocks, livestock, and farming supplies. Subsequent to Cyclone Nargis, the Foreign Agriculture Service (FAS) of the United States Department of Agriculture (USDA) began producing a series of commodity intelligence reports focusing on Myanmar's damaged agricultural areas. FAS' mission is to improve foreign market access to U.S. agricultural products, build new markets, improve the competitive position of U.S. agriculture in the global marketplace, and provide food aid and technical assistance to foreign countries. FAS uses remote sensing and GIS software to analyze global crop production capacity, then issues commodity intelligence reports highlighting current international crop conditions. Published on the FAS Web site, these reports contain maps created with geospatial data and the technology found in ArcGIS software, which has been the USDA's standard GIS since 2001. The maps that support FAS commodity intelligence reports include data from various sources. For example, satellite imagery obtained from the U.S. National Aeronautics and Space Administration's moderate-resolution imaging spectroradiometer satellite delineates the postcyclone flooding region. Combined with rice land-cover classification data from the Landsat satellite program and the tools in ArcGIS software, maps of the damaged rice production regions of Myanmar are easily created. These FAS-produced maps reveal the cyclone's effect on cropland and livestock, the severity of flooding, and the rate of cropland recovery. The United Nations (UN), nongovernmental organizations, and the international agriculture industry have also used these resources to evaluate the scope of the cyclone's impact. Due to political issues within the Burmese military, relief efforts were slow, and little could be done in the days after the storm to aid in the recovery of Myanmar's flooded rice croplands, much less the salvation of its next harvest. Saltwater is a serious problem for rice cultivation, and Myanmar's inundated fields would need to be drained and flushed with sufficient fresh water before normal cultivation could be considered. Drainage became a problem even in areas where loss of life in the local farm population was light, because the rice fields are designed to store rainfall and freshwater irrigation. Not only did the cyclone destroy lives and property, it wiped out the country's agricultural economy indefinitely. "Our GIS maps and flood classification data show that the areas originally inundated by the storm account for approximately 1.7 million hectares of rice—24 percent of the national rice area—or roughly 2.5 million tons of rice production on a milled basis," says FAS international crop assessment analyst Michael Shean. "The core region most severely damaged by the tidal wave and high winds, however, accounted for approximately 900,000 hectares of rice land, 13 percent of the national rice area, and roughly 1.35 million tons of milled rice production. In addition, field reports from inside the affected region indicate that within these rice production areas, large numbers of villages were destroyed, along with much of their food stocks, livestock, and farming supplies." 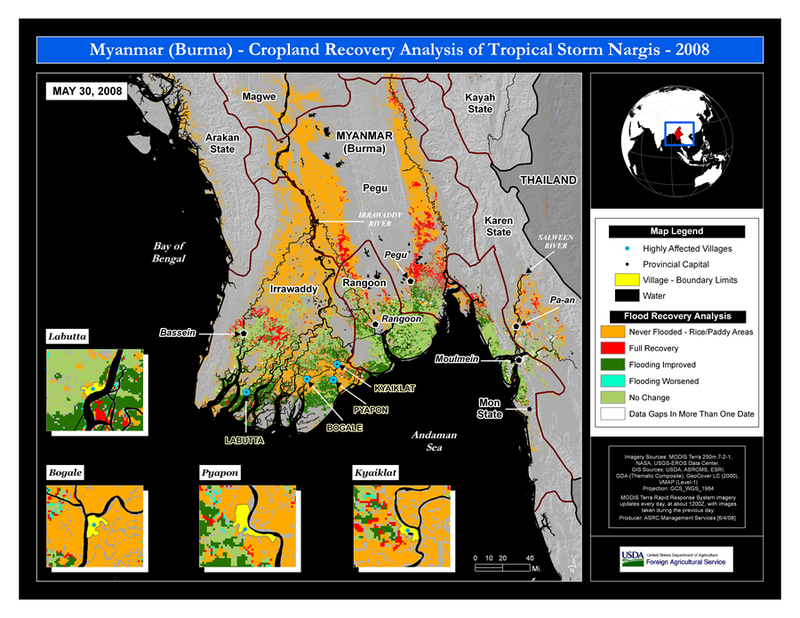 A GIS map created 28 days after Cyclone Nargis passed through Mayanmar shows the progress of the country's cropland recovery efforts. ArcGIS software-based maps depicting the cyclone damage in Myanmar provide the agriculture industry with a detailed perspective of where remediation efforts need to be conducted before the country can produce a normal rice harvest. In FAS' second commodity intelligence report, issued on June 10, 2008, GIS maps showed that approximately 80 percent of the original inundated rice production area was still affected by some degree of flooding. Fortunately, at that time, conditions in the core damage zone had improved considerably, with only 418,000 hectares, or 46 percent of the original area, still showing flood damage. The June 10 report also stated that Myanmar's heavy rainfall season is approaching and that it was unknown whether the rain itself would provide sufficient aid in diluting the salt levels in inundated fields or in flushing saltwater from affected soils. In the meantime, the Myanmar government began seeking financial aid to acquire 6,000 tons of salt-tolerant rice seeds to sow approximately 100,000 hectares of rice in areas with the worst saline conditions. According to FAS map data, however, this still amounts to only 6 percent of the inundated region. In the farmable areas, the morbid tasks of determining mortality and relocating human and livestock populations continue. A lack of accurate assessments on the ground about basic needs, such as food, shelter, drinking water, and farm supplies, have made it difficult for FAS or the UN to determine the actual capacity of recovered farming villages and their ability to cultivate a normal rice crop. Fortunately, livestock source data provided by the UN's Food and Agriculture Organization (FAO) is available. FAS used it to author a Cyclone Nargis Livestock Impact Analysis and GIS map. FAO data indicates that most rice farmers in Myanmar own two water buffalo or cattle to carry out their normal farm operations. Scientists estimate that nearly 200,000 cattle were killed in the storm. The FAS map is useful for prioritizing areas where donated cattle or even gas-powered farming equipment is most needed. 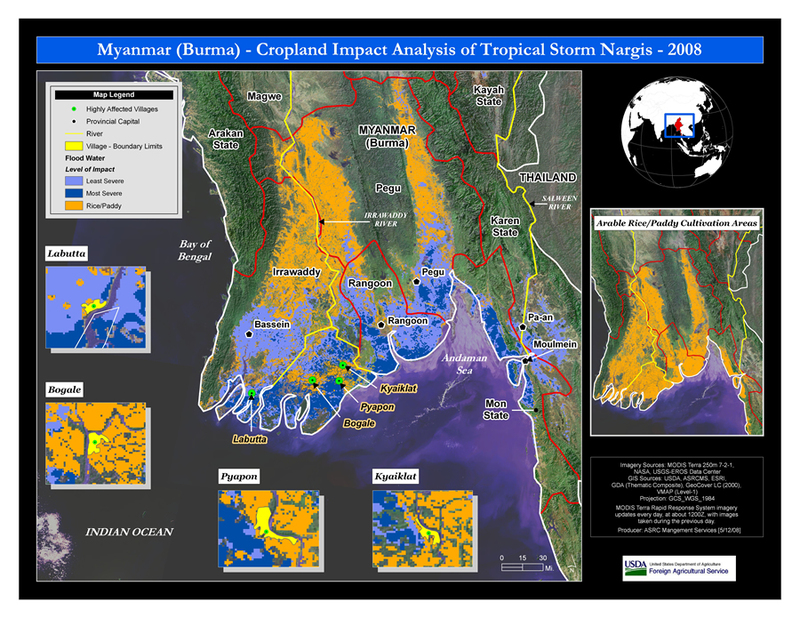 Post-Cyclone Nargis GIS maps of Myanmar generated by FAS have proven so valuable in monitoring the flood recovery in Myanmar that the agency has received custom map requests from many organizations. "Our maps and data layers are available on a case-by-case basis," says Shean. "We have recently been contacted by a couple of UN groups that are interested in our Myanmar flood analysis layers." As conditions change and new data becomes available, FAS will continue to produce its own GIS maps, perform analysis, and issue commodity intelligence reports focused on Myanmar's rice production regions. For more information, contact Michael Shean, crop assessment analyst, USDA's Foreign Agricultural Service (e-mail: Michael.Shean@fas.usda.gov). For more information on FAS commodity intelligence reports for Myanmar, visit www.fas.usda.gov.